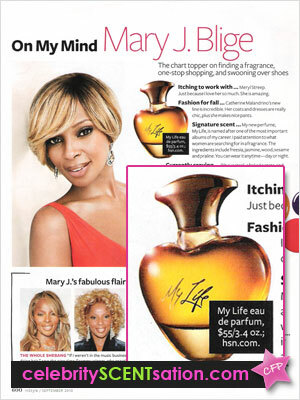 My Life by Mary J Blige, is the singer's debut celebrity fragrance, launched July 31, 2010 by Carol's Daughter and sold exclusively on HSN. Available in 1.7 oz EDP and matching body products. "A captivating fragrance evoking intrique, complexity, confidence and warmth." After a career of number one songs, Mary J. Blige creates her latest record-breaking hit: a fragrance inspired by her personal journey. When did you become passionate about fragrance? "Back in the day, most perfume smelled too strong for me, so I didn't wear any, but I finally found one I loved and stocked up on it. Every time I wore it, women would ask me what it was and I still have never told anyone my secret. I was inspired to create My Life so I could finally share a personaly part of my life beyond my music." Does My Life smell like your secret scent? "They both have jasmine. I didn't think I was a floral girl, by Lisa Price, the founder of beauty brand Carol's Daughter, with whom I collaborated on the fragrance, told me it was the jasmine in my favorite scent that was making me go crazy for it. As a result, jasmine is a heart note. My Life is soft, with notes of pear and gardenia, but still bold, with a woody base." The white freesia and apricot flower-infused My Life Mary J. Blige Eau de Parfum is much like the singer herself: confident, feminine, and in demand. 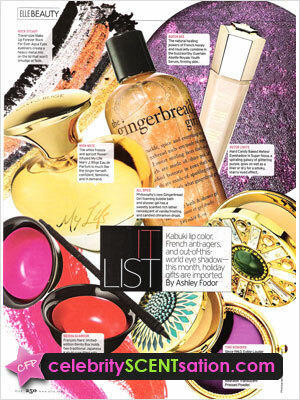 The chart topper on finding a fragrance, one-stop shopping, and swooning over shoes. My Life eau de parfum, $55 / 3.4 oz. ; hsn.com. Match the star to her scent: We gave readers our seven favorite new celeb fragrances (minus their labels) to guess whose was whose just by sniffing. Fun! Her guess: Mary J. Blige. "The scent is bold and feminine, just like Mary. It made me want to put on a pair of fabulous heels." She guessed right! 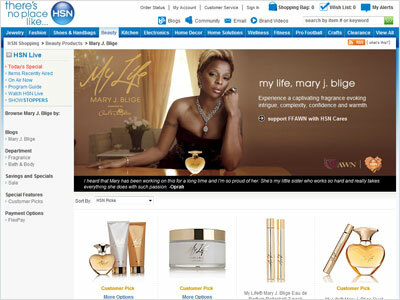 My Life by Mary J. Blige ($55, hsn.com). Try one of these fresh fragrances. The pretty bottle may catch your eye, but one whiff will keep you spraying all season long. A fruity-floral scent that combines fresh gardenia and pear with gold lily and apricot. 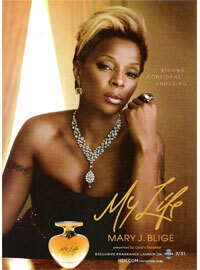 R & B powerhouse Mary J. Blige nixed the drama long ago. Here, she gives us the 411 on her purse. "Women were my inspiration for this scent. It has a softness to it because sometimes we feel soft, but there's also a fruitiness for when you're feeling edgy and want someone to want to, like, lick your arm. There's a toughness, too, which are the wood notes - it shows people that we're the full package. 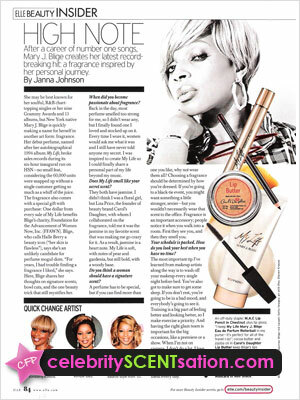 [Mary J. Blige] cofounded the Foundation for the Advancement of Women Now, which supports women's career development, self-esteem, and education through scholarships... "My Life was the name of the album that started my women's-empowerment movement," she says, "so I wanted to make [this fragrance] for women." Known for wearing her heart on her sleeve no matter what she's going through, Blige asked that the perfume come in a heart-shaped bottle. "So many women are all heart", she says. And in her case, also a little grit. Mary J. Blige partnered with Carol's Daughter to create My Life, a fragrance with notes of gardenia, pear, freesia, and sesame. "It's the epitome of a confident woman," says Blige. The $55 fragrance will be available exclusively through HSN starting July 31. One dollar from each purchase will be donated to the Foundation for the Advancement of Women Now, a charity cofounded by Blige. Celebrate the journey of a lifetime with My Life the new fragrance from Mary J. Blige presented by Carol's Daughter. A lyrical composition of fragrant notes, this captivating fragrance evokes the intrigue and complexity of her evolution, strength, soul and passion. It's her story...as only she can tell it.